There are many needles in the world. Not just different sizes but double points, straight needles, and circulars (all lengths). With so many needles, what do you get a knitter? Why a Click set of course! If you have a knitter on your list who seems to have all the yarn they need (first of all, they don’t and they never will have all the yarn they need but I digress) perhaps a fantastic set of needles is the right gift for them. Trust me, it will be amazing under the tree and even if you aren’t a knitter and can’t figure out why they might want such a thing, they will love it. 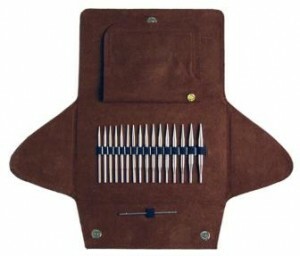 My fave: the Addi Lace Click set, it’s got just about everything you will need for any knitting project. This entry was posted on Sunday, December 11th, 2011 at 12:07 am	and is filed under Uncategorized. You can follow any responses to this entry through the RSS 2.0 feed. Both comments and pings are currently closed.